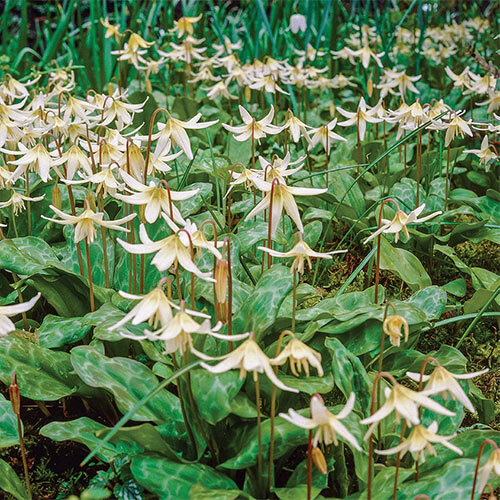 Sitting atop petite 8-10" stems, the lovely white reflexed blooms of this award-winning variety bear a light reddish-brown center ring, and bestow plenty of easy, laid-back beauty on borders, rock gardens and woodland areas. Foliage has a nice marbled appearance. Grows and multiplies easily. Naturalizes well. Reflexed flowers, approx. 1.5" in diameter. Often multiple flowers per stem. Glossy lance-shaped, marbled green leaves.